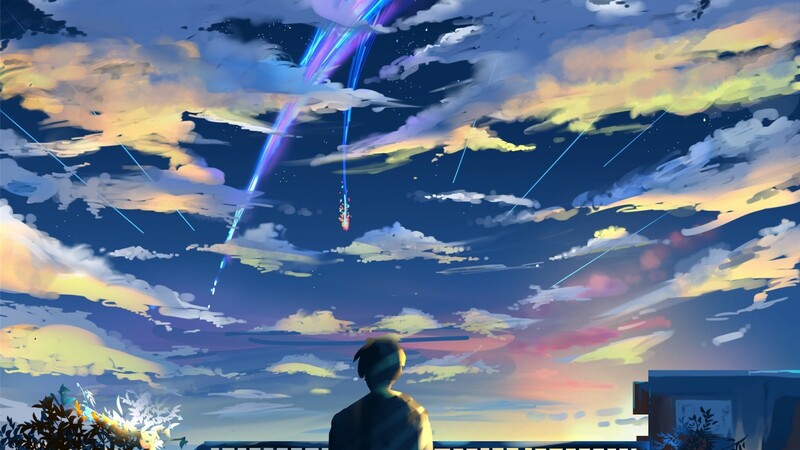 Director/Screenplay/Art Direction – Makoto Shinkai, Based on His Novel, Producers – Koichiro Ito, Noritaka Kawaguchi, Genki Kawamura & Katsuhiro Takei, Music – Radwimps, Supervising Animation Director – Masashi Ando. Production Company – CoMix Wave Films/Amuse/The Answer Studio/East Japan Marketing & Communications Inc./Kadokawa/Lawson HMV Entertainment (LHE)/Toho Company/Vogue Ting. 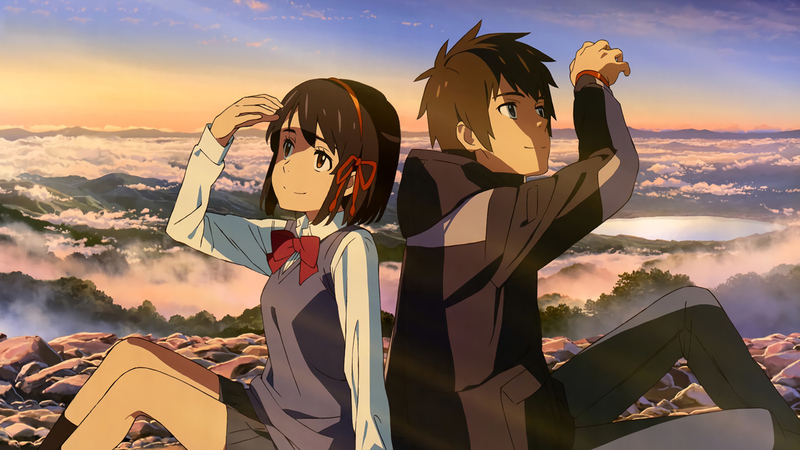 Mitsuha Miyamizu, a schoolgirl in the small rural town of Itomori, and Taki Tachibana, a schoolboy working as a waiter in Tokyo, each wake up on alternate days inhabiting the other’s body. They agree to communicate, leaving a diary of things that has happened while they were in the other’s bodies. Mitsuha tells how she is going to watch the approach of the comet Tiamat but thereafter the exchange between them stops. Taki is saddened but as time goes on he starts to lose memory of her. Able to draw in detail the area where she lived, he heads in search of these locations – only to discover that Itomori was obliterated three years ago by a fragment that split off from the comet. He enters a shrine near the impact crater and is able to cross between times just as twilight comes, allowing him to briefly meet Mitsuha. Able to go back and inhabit her body again, he desperately tries to find a means to evacuate the town before the splinter from the comet kills Mitsuha and all of the townspeople. Makoto Shinkai is a name that has been gaining growing acclaim in Japanese anime. Shinkai’s first work was the 25-minute long Voices of a Distant Star (2002) about interstellar email communication. This was followed by the feature-length The Place Promised in Our Early Days (2004), set in an alternate world Japan, and 5 Centimetres Per Second (2007) about a friendship between two people over the years. The work that caused Shinkai’s name to be noticed was Children Who Chase Lost Voices from the Deep (2011), a beautiful fantasy epic in the Hayao Miyazaki style. Shinkai followed this with the non-genre The Garden of Words (2013). The premise of Your Name. seems to have been borrowed from the live-action Passion of Mind (2000), which had two Demi Moore’s on either side of the world, each dreaming they were living the other’s life. That film ended with an absurdly contrived mundane revelation whereas here Makoto Shinkai plays the premise with far more confidence in the fantasy elements than Passion of Mind ever did. While Passion of Mind had either dreamer as a passive observer in the other’s life, this has the two devising a way of communicating with one another and then, the logical step that Passion of Mind never thought of, to set out to find the other. Your Name. starts out as typical shoujo drama – the look is the classical one of characters with large oversized eyes and the artwork resembles the clean simplicity of Hayao Miyazaki. Maybe a shoujo anime with a cute bodyswap premise – in the early sections, Shinkai derives humour from Taki waking up to find he has breasts and Mitsuha in his body adding a feminine touch that allows him to win the girl he likes. All of which seems to be setting up a light and fluffy film, which seemed a little more on the juvenile side than the anime classic I was expecting from the film’s strong advance word. At almost the halfway point, Your Name. turns into something else altogether. Makoto Shinkai pulls the rug out from under us with the shock revelation that Itomori was wiped out by the comet and the secondary revelation that this happened three years ago and that Taki has been communicating with Mitsuha across time. It then becomes a completely different story about trying to prevent the tragedy from occurring. The mid-film shift does however feel odd – going from a bodyswap film like Passion of Mind to something akin to Timescape (1992) with its cross-temporal conundrums about preventing a town from being struck by a meteorite. That and maybe a few dashes of the impossible day/night romance of a film like Ladyhawke (1985). I didn’t feel like these plot elements or the mid-film shift in the type of story we were watching fully gelled. I wanted to be drawn in more by the characters but the film skips over them at times and instead heads off to a more drama-oriented climax about saving the village from the comet splinter, leaving two beautifully told stories that never fully satisfy. Certainly, it is in this latter half that Your Name. gains its greatest emotional strengths. The film is imbued with the longing for an impossible love that stretches across time and to someone who may even be dead but for Taki’s determination to save her. It is also a film that comes with an overwhelming sense of loss of things forgotten – its saddest moments are those when the two cross-temporal figures start to forget one another’s names.